Now Enrolling K & 1! The mission of ReGeneration Schools Cincinnati is to prepare its students to enter and succeed in college through effort, achievement, and the content of their character. ReGeneration Schools Cincinnati is launching a K-4 community school in the Bond Hill neighborhood. We are now enrolling kindergarten and first grade students for the August 2019 school start. The school is tuition free and open to all rising kindergarten or first grade student in Ohio. ReGeneration prepares all students to enter and succeed in college through effort, achievement, and the content of their character. All students demonstrate excellence in reading, writing, math, science and history while consistently exemplifying the virtues of respect, integrity, diligence, responsibility, compassion and perseverance. We work diligently to create schools that are academically rigorous, build character, and are infused with joy. We aspire to create the best elementary schools in Cincinnati, where excellence is the only acceptable standard. ReGeneration is characterized by a culture that is orderly, supportive, and focused on academic work. The ethos of the community is one of mutual care and respect. Students have the right to a quality education that supports their development into productive and responsible citizens. Since 2012, ReGeneration Schools has been managing six turnaround schools in Chicago and has significantly raised achievement in all of them. Now, it is time to give back to Cincinnati, the hometown of ReGeneration's CEO, Stacey Shells, and COO, Andres Tolentino. Bianca Jones is the Founding Principal of ReGeneration Schools’ first elementary school in Cincinnati, Ohio. Dr. Jones previously served as the Manager of Schools supports for three charter schools in Nashville, TN. She taught for eight years in district and charter schools before becoming an assistant principal, a principal, and helping to open two charter schools. Bianca holds a Bachelor’s degree from Aquinas College, a Master of Education from Trevecca Nazarene University, and a Doctorate of Education from Trevecca Nazerene. David Andres Tolentino is a Cincinnati native and founding member of ReGeneration Schools. A graduate from The Seven Hills School and the University of Cincinnati, Mr. Tolentino most recently served as the Director of Operations at CICS - Avalon/South Shore campus in Chicago. Andres led the operations team to create a successful school environment that fosters student achievement and character development. 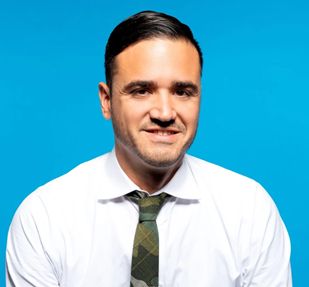 Andres was previously an Art Teacher and Special Projects Coordinator for Uncommon Schools - Rochester Prep in Rochester, New York.